Kasandrinos International Olive Oil 20% Off! Sitewide! You are here: Home / Sponsored / Kasandrinos International Olive Oil 20% Off! Sitewide! 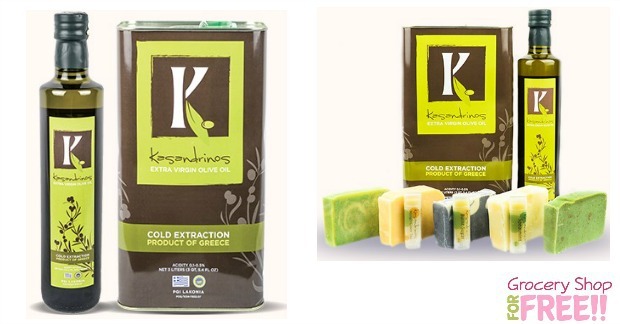 Kasandrinos International Olive Oil 20% Off! Kasandrinos International proudly offers a single source organic extra virgin olive oil and other high quality food and skin care products. They only offer this year’s harvest of olive oil. When you use discount code: holidayguide2016 at checkout you’ll get 20% off! We indicatively mention the processes that take place in the local olive oil mills. The olive oil treatment includes the collection of olives, their washing, grinding, kneading, the receipt and finally the cleaning of the produced olive oil. Receipt of olives: Following their harvest, olives are delivered to the processing plants. Their transfer is made in plastic crates with holes for ventilation or cloth sacks. Their process is effectuated as soon as possible, i.e. within 24 hours. Removal of leaves, impurities and washing: Foreign substances, if ground along with the olives, adversely affect the scent of olive oil and increase its acidity. Therefore, olive are initially placed in the olives receipt funnel and then in the leaves remover for the removal of leaves and other substances. Then they are washed for the removal of foreign substances (mud, earth, dust, dirt). Grinding of olives: in modern facilities grinding is effectuated by hammer mills or grinders. Kneading of the olive paste: Following grinding, the olive past is mixed in the kneader (stainless tanks with double walls heated with warm water circulation, the temperature of which shall not exceed 26 C). Kneading is a principal stage of process: it usually lasts 30 minutes and contributes to the consolidation of small olive oil droplets with bigger ones. Olive oil extraction: The receipt of olive oil is made with two process methods: the two-phase and three-phase process with the use of modern centrifugation machines that can separate olive oil from olive paste without adding water. In this way there is not liquid waste (sewage), as they are integrated in the olive husk, which therefore it contains more humidity in relation to that produced in three-phase process. Centrifugation: The olive oil is separated by the olive hush (wherein sewage is integrated) with the influence of centrifugal force which increases the specific weight difference between olive oil and liquid olive husk. The process is effectuated with centrifugal separator with horizontal spindle. The centrifugal force coefficient (G) is bigger in two-phase systems (3000 – 3600) than in three-phase systems (2000 – 2600). The olive oil extracted by two-phase decanter, may contain small solid particles, which are however removed with the use of reciprocating screens. Olive oil cleaning: The last stage of olive oil production comprises its cleaning from solid particles (pieces of pulp, peel, particles of olive nucleus etc.) that are dissolved in the liquid. These particles’ weight is calculated to be 0.5 – 1% of the total weight during liquid stage and they are removed with the use of reciprocating screens (defecation screens). Finally, it follows the separation of olive oil from vegetal liquids with the use of centrifugation separators and the final product is stored in stainless tanks.